Drill It. Blast it. Crush it. | Rock it. ARI performs rock drilling and blasting services throughout the Western United States. Aggregate Resource Drilling, LLC performs rock drilling and blasting services for rock quarries of all sizes, utility/trench drilling and blasting, wind farm foundation drilling and blasting, dam demolition drilling and blasting, bridge demolition drilling and blasting, street, road and highway drilling and blasting, and rock drilling and blasting for emergency slide repairs. 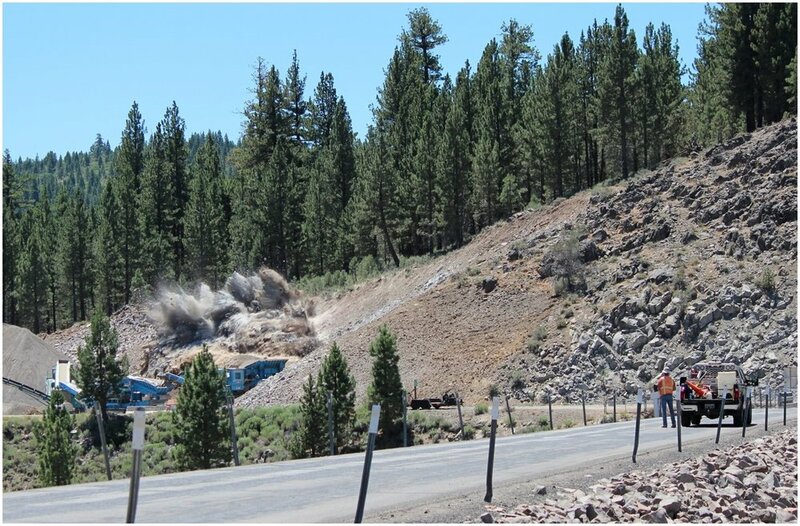 ARI performs rock drilling and blasting services in quarries across the Western United States. ARI uses the latest in blasting technology in order to mitigate risks of damage caused by vibration, airblast and flyrock. We have extensive experience in blasting for demolition of heavy/civil structures, such as blasting for bridge and dam demolition projects. ARI can perform controlled blasting for residential foundation and trenchline construction, as well as foundations for wind turbine towers. We perform wind turbine tower foundation drilling and blasting. This hole is from the project site, Big Timber, MT. The dimensions of the finished hole are 18'6" diameter and 30' deep.